← Legal Article : Guidelines – Can Foreigners Buy Property in Malaysia? 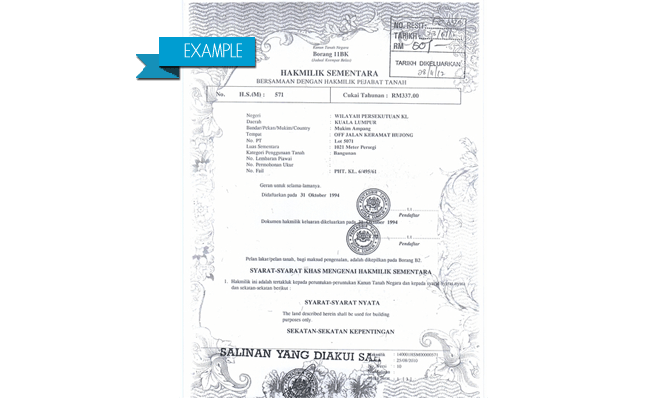 When purchasing or refinancing a property in Malaysia, there are many different attributes the property can have, most of which are stated in the property’s land title. All properties should have a title deed which denotes the owner of a property. Each attribute requires different processes during the legal transaction, and can affect your housing loan/ mortgage application. Leasehold land belongs to the state and is leased out to an “owner” for a number of years. Towards the end of a lease, owners are required to pay a fee to extend the duration of the lease. Freehold land on the other hand belongs to the owner (the purchaser) indefinitely. Additionally, during a sale and purchase process, consent is required from state authorities (Land Office) before the transfer can proceed. The state can withhold approval for any number of reasons. Due to this additional step, it can take much longer to buy / sell a leasehold property. For these reasons, freehold properties are usually more expensive than similar spec leasehold properties. When a property developer first develops a plot of land, be it 10 or 500 acres, the land will usually first have its own “master title”. The title will then be subdivided according to the various units within the project. These units can be landed properties with individual titles, or strata properties, with strata titles. Strata titles include common properties, such as roads and facilities within the development. Strata titles can be for landed properties (“landed strata” properties, such as gated and guarded developments) or for high-rise properties, such as condominiums or office blocks. Once subdivided, to transfer ownership, a Memorandum of Transfer (MoT) would be filed at the Land Office. The new purchaser’s name thus appears on the title deed itself, making him or her the new rightful owner of the property. Sometimes, a developer takes some time to subdivide the title. In such cases, to buy/sell, instead of a MoT filed at the Land Office, a temporary Deed of Assignment (DoA) is filed at the High Court. Based on the Master Title, the developer is still the rightful owner. However, the developer has “assigned all their rights” over individual parcels / units within the land over to the purchaser. Deeds of assignment hold less authority, as compared to a registered title deed, however. Buyers should ensure in such cases that the individual/strata titles are applied for by the developer, and the official transfer of ownership process takes place. There are multiple types of approved land usage. These will affect the Loan-to-Value (LTV) ratio that banks are able to provide. 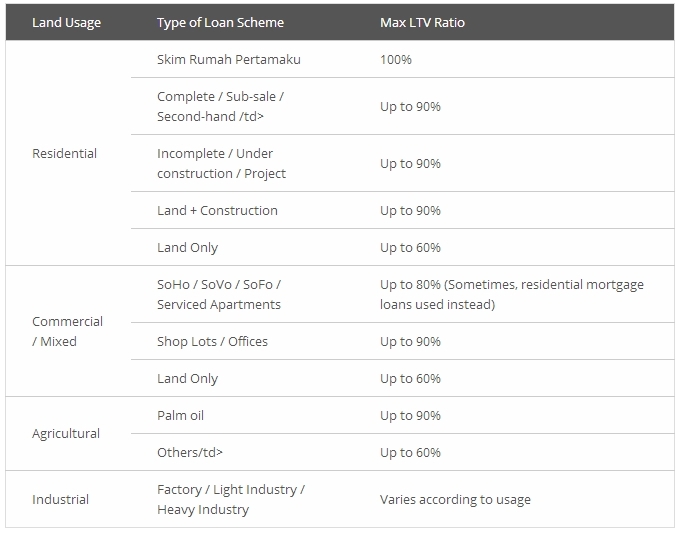 The table below is a guideline of the expected LTV ratios available for mortgage and housing loan options on the market as of 2013. 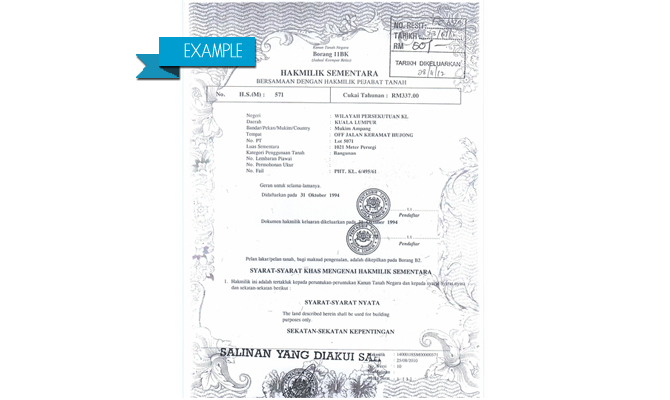 There are certain properties which have “Malay Reserve Land” status (Note: This is not the same as “Bumi Lot” properties). These properties cannot be transferred to a Non-Malay under any circumstances. And just as in leasehold properties, state consent has to be given for transfer.